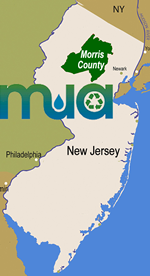 The MCMUA operates one of NJ's most comprehensive household hazardous waste (HHW) programs. This F.A.Q. page and information on hazardous materials is intended as a guide about HHW materials as well as the MCMUA's HHW program. This information is a general guide and does not constitute official rule, regulation or law. Aerosol cans containing propellant may explode if crushed or incinerated. Aerosol propellant can be flammable. Use away from heat or sparks. Breathing the propellant may be hazardous to human health. Some aerosol cans contain hazardous chemicals, e.g. pesticides, oven cleaner, etc. New can with defective nozzle should be returned to the point of purchase. Look for warning label on the product. Art materials are non-toxic if the label reads AP (approved product), CP (certified product), or HL (health label). Do not put full or partially full cans in the trash; they may explode in a trash truck. Empty aerosol containers: Aerosol can is empty when you no longer hear any air released when the nozzle is depressed and the can feels empty when shaken. If aerosol containers are acceptable in your local recycling program, remove plastic lid and place with recyclables. If not, place in the trash. Partially full containers that you know do not contain hazardous chemicals: To empty the can of its non-hazardous contents, discharge outdoors into a deep cardboard box or paper bag, and allow the box or bag to dry before placing in the trash. The empty aerosol container can then be recycled or disposed. All other aerosol containers: Save for a household hazardous waste collection or take to a commercial hazardous waste facility.